A well-suited sleep schedule at 4 to 12 months helps your baby get into a healthy rhythm, take restful naps and start sleeping through the night. Between 4 and 6 months already, the sleep schedule becomes more regular. It is the time when the chaos of the first months finally seems to make place for more structure. Many parents and babies really enjoy this time as it brings a bit more rest and time to enjoy each other in a relaxed way. Your baby may or may not quite sleep through the night yet. You may still be looking for longer naps, or more suited nap and night bed times. I was just about to give up on getting my son to sleep regularly during the day. We had started from the first weeks to create regular nap time possibilities. That usually went well for a couple of days but then he changed a feeding time and the schedule was all gone again. But then he turned six months old and, as if by magic, he started napping at these regular times. He even got so used to these naps that he really needed them. When he missed a nap for some reason, he could be really cranky later on ..."
Do keep up with the sleep schedule, and reinforce it, because it continues to structure your baby's sleep patterns. It's what helps her develop the sleeping skills she needs: easy settling into longer stretches and independent self soothing when waking up at night. 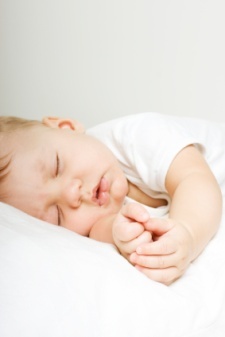 Even if it helps your baby sleep, the newly found regularity may give you some restrictions too. You might be less mobile and/or find yourself re-scheduling your day around nap times. It may not even be possible to stick to the schedule when you have older children and/or work arrangements. Therefore it remains important that you schedule sleep times that suit you well. Naps remain an important part of the sleep schedule. How many hours sleep she needs varies a lot from baby to baby but regular rest moments during the day keep her from getting over-tired. A baby who is over-tired at night will find it difficult to settle. It will then also be more difficult to sleep through the night. Remark: The tips below focus on a strictly timed nap schedule. this or another type of routine (pattern, baby-led, etc.) depending on your baby's specific needs. Be determined: when it's nap time, it's nap time. Put your baby to bed (or cot, or stroller, or sling ...), even if you are unsure she's very sleepy this time. It is the regularity of the schedule that will help her sleep. A good illustration is that many babies that do not nap easily at home, suddenly take good naps when they go to daycare or creche. That is because there is usually a strict scheme and - not in the least - there is no other option. The carers usually don't have the time to help each baby nap individually. Of course you are not a creche. If your baby is very easy with sleeping at nap times, you can be pretty flexible and shift nap times with about half an hour or so. If your baby is not easy with naps, try to be as strict as within ten minutes, it can really help her. Also, towards one year old, many babies will go from three to two naps, or from two to one. If your baby has a difficult time settling or sleeping a longer stretch, it is a good idea to experiment a bit with the nap time. Move it forward or backward in time, and see what happens. When my girl was 8 months old, we shifted her nap to one hour earlier than usual. She suddenly had three-hour naps! Before it was barely an hour. Of course, with every experiment, give it a week or so to see what happens before changing something again. When a baby sleeps poorly at night, it can seem like an obvious choice to skip a nap, or all naps during the day. However that usually does not help. It just makes a baby overtired, and that results in worse nights. Skipping a nap can be a good idea in some situations though. For example, if your baby has been taking three naps a day for a long time, and suddenly starts waking up earlier in the morning. Then one less nap can help, but always keep ensuring that she doesn't become too tired at the end of the day. Many parents find their baby sleeping through the night around 6 to 12 months, but many also continue to have one or several night feedings. A lot of it will depend purely on their physical ability to sleep for longer without food or attention. But you can create the best chances. Also here, be determined. Light or dark outside, tired or not tired: bed time is bed time. This may seem more strict than it is, no need to time your baby with a stopwatch of course. Just keep the schedule regular and recognizable for your baby. It will help her to the best sleep. New parents may find this surprising, but most parents including myself have experienced this, and it's backed up research. If your baby's usual bed time for the night is say 9pm and she has two or three awakenings during the night. Then shifting the bed time to earlier, even quite drastic to 7.30pm, can result in a wonderful sleep through night! Naturally, do not try out a new bed time every other night. Always give it a week or so before you will see the effect. It is also best to experiment in a period when your child is not ill, or teething. Although it seems logical to sleep until later if they go to bed later, in general that's not how it works and more often than not it has the inverse effect, caused by over-tiredness. Finding a regular sleep schedule for your baby towards one year old usually is not too difficult. If you remain determined, but also flexible enough to keep the schedule pleasant for both of you, you are helping your baby a long way towards good sleep. That is a lot to cope with for a little child and can affect her sleeping. With a good sleep schedule you have the best chances to find good sleep along the way. Sadly, many (!) different causes can keep disrupting your nights. My No-Tears Sleeping Through the Night guide helps you assess these and gives you the no-cry techniques to avoid any unnecessary awakenings.